When the latest AP Poll came out Monday afternoon, Tennessee was once again ranked No. 1. Following wins over Missouri and Florida last week, the Vols’ win streak was pushed to 18 games. And despite No. 2 Duke blowing past then-ranked No. 3 Virginia, Tennessee received 40 of the 64 first-place votes. Duke gained ground, doubling their first-place voting total from 12 votes to 24, but the Vols stayed above them. It’s the fourth consecutive week the Vols have been ranked No. 1, and to be frank, being dethroned was never in the cards. That is, until this week, when Tennessee travels north to Lexington to take on No. 5 Kentucky in the biggest game ever played between the two teams. But before the Vols and Cats square off, South Carolina comes to Knoxville on Wednesday night. Some believe the Vols are at risk of over-looking Frank Martin’s pesky Gamecocks. Rick Barnes, on the other hand, would be shocked if his veteran team does so. “I think our guys have so much respect for South Carolina,” Barnes said during his press conference on Monday. “Any time you are going up against South Carolina, I think you know they are going to play an extremely hard and physical game. If you’re looking at the first match-up between the two schools on Jan. 29, following a double-digit loss, Martin would say otherwise. In the midst of Tennessee winning 92-70 in Columbia, South Carolina managed to cut it to a one-possession game with 13:07 to play before the Vols pulled away. Over the final nine minutes, UT’s defense stepped up and held the Gamecocks to just seven points on 1-of-10 shooting from the field. What was a two-point game at one point turned into a 22-point victory for Tennessee thanks to a 19-6 run to close out the game. “We hang around until the 10-minute mark,” Martin said on Monday as he recalled the game-deciding stretch from the first matchup. “But then the wheels came off. The person who made life tough on the Gamecocks was Jordan Bone. 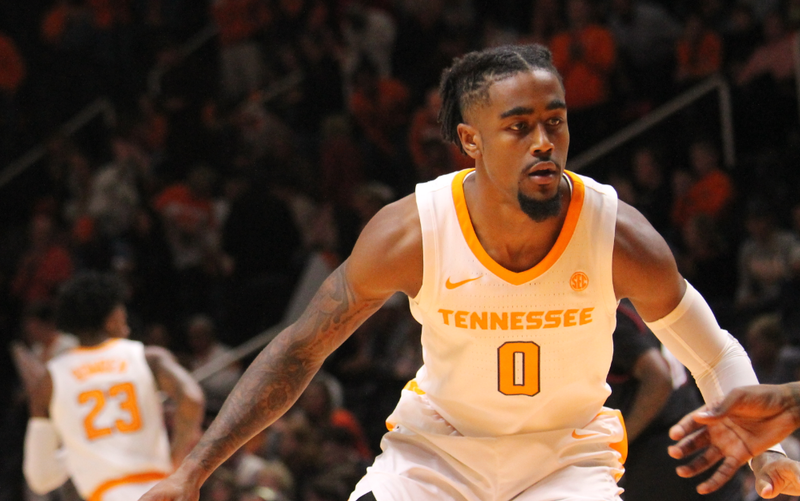 The junior point guard scored 19 points and tallied nine assists as the Vols scored 92 points – the most South Carolina had allowed all season to that point. On the night, Tennessee shot 56 percent from the field. Though Martin doesn’t think his team put up the best of fights against Bone, he still believes his squad has the personnel to try and neutralize that match-up. South Carolina may not have the veteran guard such as Duane Notice to slow Bone down like they did when Tennessee’s point guard was a freshman. But as a team, they’re capable. “There were four situations where we score, and they just get run-outs on us,” Martin recalled. “That’s a combination of guards reading the floor, identifying the ball early. And No. 2, big guys flat-out getting out-run. While South Carolina struggled to contain Bone, it was senior forward Chris Silva’s monstrous first half on the offensive end that allowed the Gamecocks to stay within reach for 30 minutes. In the first half, Silva scored 22 points on 6-of-10 shooting while hauling in six rebounds. Though he only scored six points in the second half to finish with a game-high 28 points, the veteran finished with 10 rebounds to record his 21st career double-double. As Barnes went on to say, it’s hard to keep a player like Silva from being effective. Which is why it falls on Silva’s teammates to knock down shots from the perimeter in order to take pressure away from the big man in the post. Against Tennessee the first go-round, South Carolina’s primary perimeter players were just 10-of-32 from the field and 4-of-14 from the 3-point line. Tre Campbell alone accounted for four of the made threes. Tennessee, on the other hand, was 7-of-19 from the 3-point line. Bone was 3-of-5 from the 3-point line while Lamonte Turner was 3-of-6. Admiral Schofield also chipped in a three. “When we made mistakes on the perimeter, and they got open threes, they made them,” Martin stated. “When they made mistakes and we got open threes, we missed them. Tennessee (22-1, 10-0 SEC) and South Carolina (12-11, 7-3 SEC) tip off from Thompson-Boling Arena at 6:30 p.m. ET on Wednesday night.